The Cook Islands Football Association’s President Lee Harmon and Board Member Moeroa Tamangaro were only too happy to have met the football star at the 2010 FIFA World Cup that took place recently in Johannesburg, South Africa. 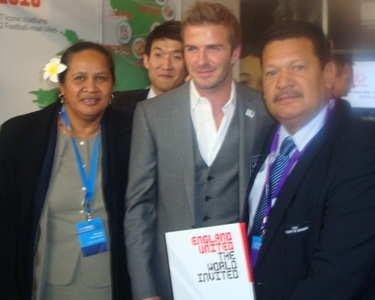 They spotted Beckham at the English booth for the bid campaign to host the 2018 FIFA World Cup. England is the first country to say clearly that they will be bidding to stage the 2018 finals but it is certain that they will face stiff opposition from many rivals. England midfielder David Beckham, Dutch legend Ruud Gullit, Football Federation Australia chairman Frank Lowy, Japan Football Association President Motoaki Inukai, Korean Football Association chairman Sung-Joo Han, chairman of Qatar’s bid His Excellency Sheikh Mohammed bin Hamad Al Thani, Russia’s Deputy Prime Minister Igor Shuvalov and Spanish Football Federation President Angel Maria Villar Llona all helped present their countries’ bidding documents. Next PostCIFA embraces new admin building.